Before I get to my post, I have to say that this is my first post on my new laptop! The husband was super sweet and surprised me with a new one since my old dinosaur was giving me so many problems. He wanted me to have a nicer, faster one to do my blogging on. Everyone say it with me, "Awwwwwwww!!" This is the last of my Twilight posts, well for a while, anyway. I promise. This mani/pedi combo was inspired by, duh, the Twilight Saga, and more specifically, Eclipse. I saw the movie last night, and I loved it. I won't go into the nitty-gritty details, as I know most of you really don't care. I know it's not going to be an Oscar winner, but I loved the movie for what it is, and I do recommend it for its entertainment purposes. It's one you can just sit back and watch. 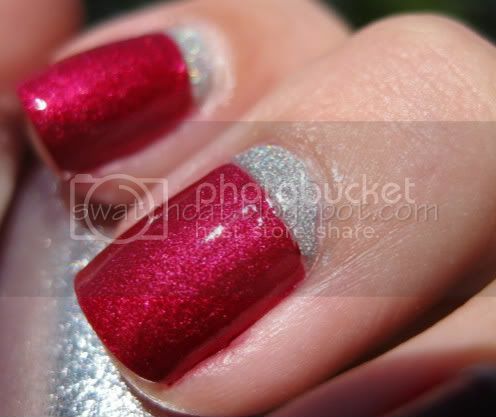 For the mani, I wanted the blood red (Zoya Posh) with the sparkle factor (OPI DS Coronation) to represent the vampires. 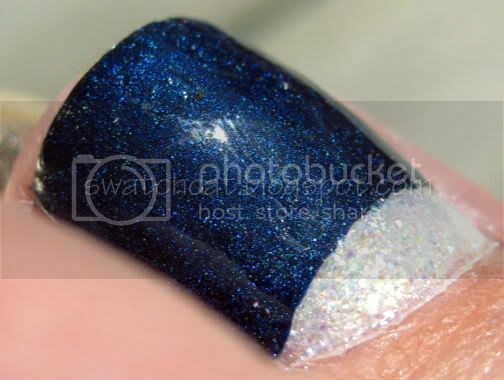 See the pretty holo! I chose to try out the crescent trend, and...I'm gonna need more practice. It turned out okay, but not great. Still, I did get compliments, so I'll count it as a win! 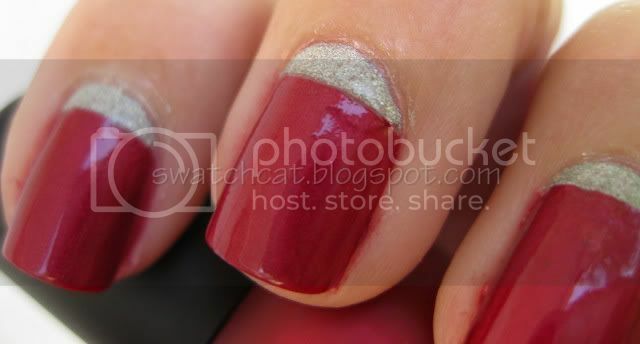 To see more pictures of the mani and the inspired pedi keep reading! If you've read the books, you know that Edward's favorite color on Bella is deep blue. OPI DS Fantasy fits that bill exactly. It's a beautiful, deep, sparkling blue. It's a shame it's discontinued. I found mine on e-Bay for a pretty reasonable price, though, if you really like, you can track it down. I again wanted to include the sparkle factor, so I chose to do a half-moon at the base of the nail with a sparkly glitter polish by China Glaze. I love this pedi! It's so pretty!! As I was photographing this set of NOTDs, I realized it's also red, white and blue with lots of sparkle. Perfect for Independence Day! And totally an accident on my part...hmmm, maybe I shouldn't say that. Maybe I should say I did the Independence Day mani/pedi and the Twilight-inspiration was an accident. Makes me seem less like a dork. OK, that's what we'll do. We'll keep the real inspiration just between us. swatchcats C and D were on hand for the photoshoot. 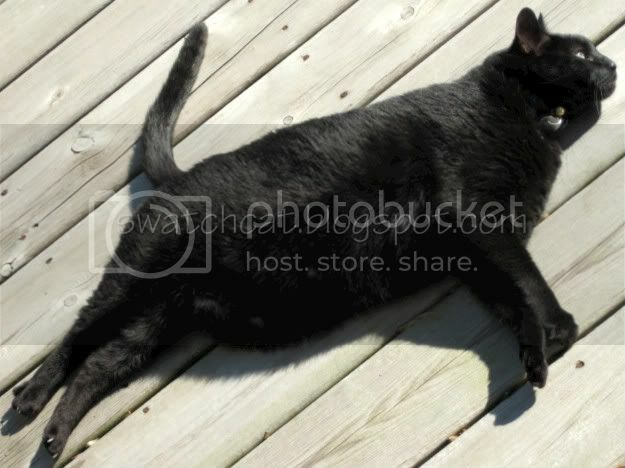 Per the usual, swatchcat D just conked out in the sun. 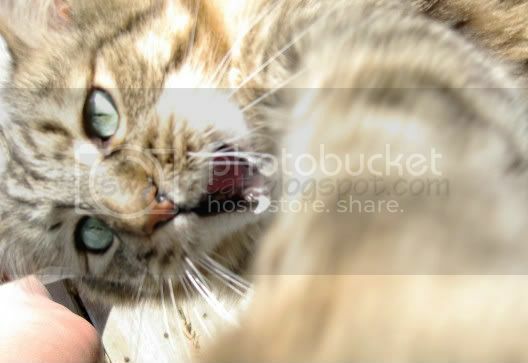 swatchcat C, on the other hand, decided this was the day he was taking control of the camera. 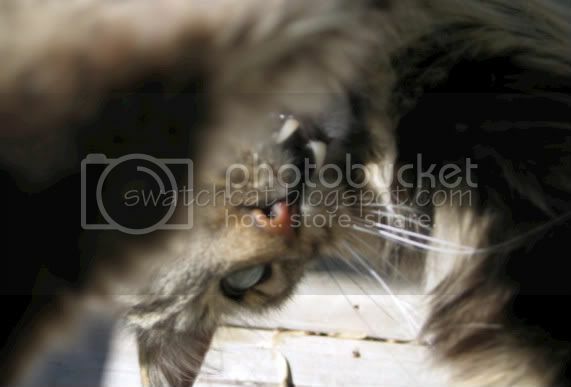 With those fangs hanging out...swatchcat C must be Team Edward, too! Thank you! I think kitties make everything better! I love your manicure and pedicure! 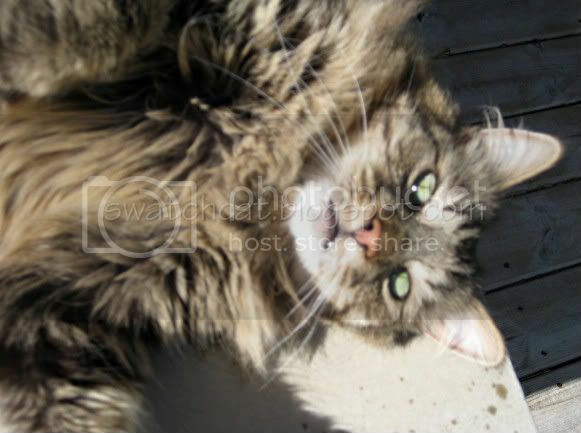 SwatchcatC is so adorable.